An Iron Phi technical shirt for the athletic endeavor ($1,000 raised), a quarter-zip Under Armour jacket ($2,500 raised) and a full zip fleece ($5,000 raised). An Iron Phi “Bond Number." A discount to the The Phi Delt Store where Iron Phi gear can be purchased. Recognition in The Scroll and on the Iron Phi Facebook, Twitter, and Instagram accounts. Personal satisfaction for contributing to the fight against Lou Gehrig’s disease and to the strengthening of Phi Delta Theta. A healthier body and opportunity to achieve an athletic goal. The opportunity to be amongst a select Phi Delt brotherhood of athletes. 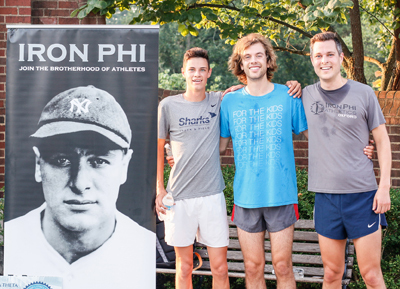 The Iron Horse Award is given each year to the individual who raises the most money within the Iron Phi program. Lou Gehrig was known as the "Iron Horse" during his baseball career because of his durability and perseverance. His prowess as a hitter, consecutive games-played record (2,130), and never-give-up attitude after being stricken with ALS inspired those around him. Many potential Iron Phis hit a fundraising roadblock. When it comes to raising money for ALS, Brother Jackson said, “think it – do it.” Honoring the fundraising spirit of Brother Jackson, the “Clark Jackson Award” is given to our top fundraising chapter. There is no better way to honor Brother Jackson than to tie his name to an award that will be given for years to come. The recipient of the Clark Jackson Award receives an Iron Phi branded wooden bat and wall mount from the Cooperstown Bat Company. Engraved on the bat is the chapter's name, amount raised and the name of the award.